Jobs vs Careers – What’s the difference? Jobs and Careers – How will it affect your future? The idea that jobs and a careers hold the same meaning is a common misconception among the younger generation. As a young adult many of us have part-time jobs in order to fund a lifestyle of going out and meeting friends, you purely take the job for the money most of the time. A job usually is taken for financial reasons, everyone needs income in order to live. Taking a job however, may not mean you want that title/position for the rest of your working life. Most careers start with education. Many people work jobs because they don’t have the education needed to enter careers, though jobs can certainly turn into careers, regardless of type of employment. Careers are about building on experience and advancing your job skills and knowledge. Even though individuals work very hard at a job and are paid generously, a career takes much more motivation and forward-thinking. Some of Estio Training’s Apprentices hard at work. Jobs can help kick-start careers and give individuals the opportunity to progress in an industry or company, especially if they didn’t go on to do higher education, whether that be college, apprenticeship or University, it may still lead to a possible career. Striving for a career shows you care more about the future than you do a wage at the end of the month, everyone has to start somewhere and sometimes you have to work your way up to the ideal career. You’ll want to develop your talents in the work place and really enjoy what you do. Making Monday mornings all that less daunting. A career takes goal setting. Follow your interests, skills and talents to find the right career that will bring you personal happiness and financially support you. 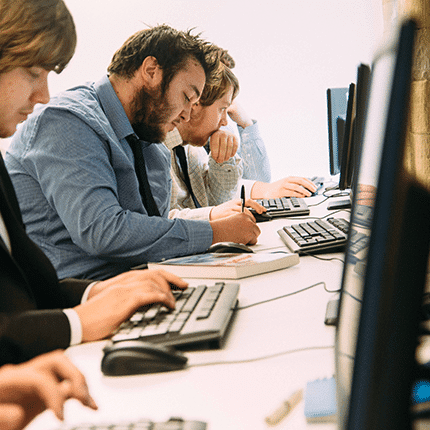 Why not start an IT Apprenticeship with Estio Training to kick-start YOUR career! You can apply for a job, but you can’t apply for a career. A job is given to you; a career is made by you.